In todays world it's near impossible to find a modern design diva or fashion fanatic that doesn't totally worship Kelly Wearstler, and I'm no exception to this rule. With her ready-to-wear line turning 1, I decided to take a look at some of her edgy fall designs next to a few of my favorite interior images. 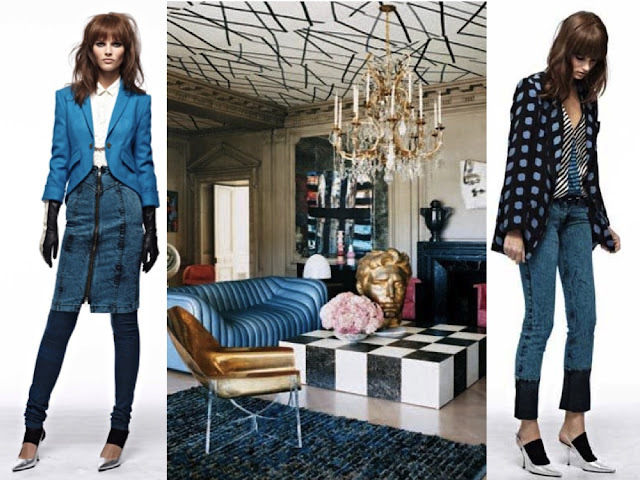 Kelly Wearstler's living room stuns with graphic patterns and cool, layered shades of blue. Wearstler's fall 2012 ready-to-wear offerings have the same great color layering and this season she introduces denim to her line. She gives us six colors of acid washed jeans to choose from - check out my favorite, the Mason jeans in jade. Love her black and white coffee table? The Cube Batik Print pencil skirt is a perfect translation. 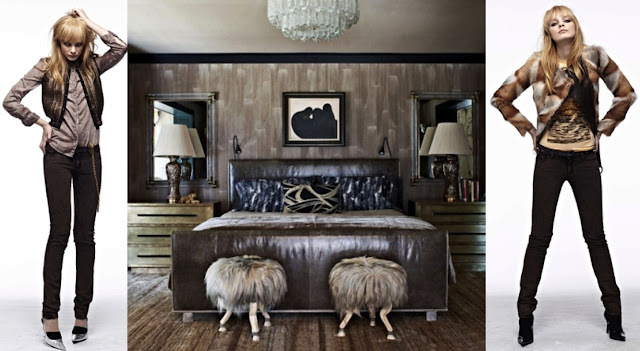 I adore this seductive master bedroom, recently featured in Elle Decor. Extravagant layers and textures elevate the traditional neutral toned room to a glam 1970s abode. Wearstler's Winston Fox Fur Jacket (right) has a similar vibe of unassuming opulence. Kelly Wearstler is known for Hollywood Regency designs shows her over the top layering of colors and fabrics in her home office. Quirky gold chairs add an unexpected element to what could be over the top girly purple and pink hues. Raspberry tuxedo trousers (similar here) combined with an eighties inspired muscle tank give a similar effect. When Kelly Wearstler designed the Viceroy Santa Monica she fused classic sophistication and contemporary chic.In her Fall 2012 ready-to-wear collection modern shapes and color blocking echo the British Regency style Wearstler used when designing the Viceroy Santa Monica in all kelly green, white and black. Fabulous fashion/interiors interpretation! Absolutely love that first denim look on the top left! This is an amazing post! I love the way you've incorporated fashion and design! What a fantastic idea! Dig it. As a newbie to blogger I'm really enjoying your blog! I agree. . . I LOVE her! Those rooms and outfits are all so fabulous! Thanks for the inspiration! That rug in the 4th photo is blowing my mind!! Not to mention the tufted green sofa is absolutley amazing as well. This post was fantastic! You are SO talented. I love the combination of interiors and fashion...you nailed it. Oh man! I too am in love with Kelly Wearstler. Girl crush alert to the nth degree! Awesome idea for your post! i love that KW is a jack of all trades...and those acid wash jeans in the first collage are insane..i absolutely love them! This is one super stylish post....love the connections between fashion & interiors by KW!! I love the pairings you made here - I would've never thought to look at it that way, but you are right that you can totally see common themes in her home and her designs. Those denim looks are rad. Super inspiring! Love the decor! Love the fashion and decor combo! If you get a sec, I'd love to hear your thoughts on my latest posts! Gorgeous rooms paired with fabulous fashion! I love it! this is such a great collection! love! What a great pairings! The living room, for me, it´s perfect! I love the black and white table with the touches of gold and blue. And her home office it´s nuts I´m deeply in love with those handed-shape gold chairs! Great blog. I´m starting my own so stop by if you want and leave a comment or whatever you like! If you like it we could follow on bloglovin! Love that mint green dress! I've never heard of Kelly Wearstler but her designs are stunning, I will check her out! Yup, totally AGREED on all counts! When I used to intern for her I swear every morning was like anticipating a runway show...what she'd rock, how she'd style her hair, and of course the endless array of AMAZING designer kicks day in, day out...this woman is the EPITOME of SoCal cool! Beautiful collection and so brilliantly curated!